It's no secret that I have a soft spot for dogs, but it goes beyond affection for them as household companions and to a genuine respect for what they have and continue to contribute to our society. It s known we developed a symbiotic relationship from early years and so many times they have helped us from herding and protecting our livestock to hunting other beasts for food or safety (such as by killing rats that carry disease). Today they do many more amazing things that have evolved from their original roles like serving the disabled, finding and rescuing lost people, even detecting disease. A saying goes that behind ever man is a great woman, but I think you could replace 'woman' with dog as often as not. Since so many activities that are important to men often include dogs, to continue to sing the praises of dogs, and champion for their respect and humane treatment, I am starting a new column called Man's Best Friend which will cover stories of Great Dogs making Great Men. For my first entry, I want to talk about two related organizations that serve the dogs that serve us. When we think of those that protect and serve us we first think of the police and military, but those men and women have their own forces of defenders - service dogs that help them not only during but after their careers. Dogs put their lives on the line to serve alongside our police and military personnel helping them as drug and bomb detectors but also as protectors and guards, we know that a dog even helped the unit that went after and got bin Laden. But dogs also help the men and women of our armed forces after their careers are done, assisting those disabled in combat and even being therapeutic for those with PTSD. Thankfully organizations exist to support the dogs in their work supporting us. While on duty, dogs protect and assist police and military but for a long time while the men and women were also protected by vests the dogs . That is changing though as vests and gar have been designed for their canine companions. The problem is for many organizations like local police forces the cost is prohibitive. But that can be addressed by providing the gear to the forces. Wisconsin Vest-A-Dog seeks to do just that by raising funds to provide body armor to service dogs at enforcement agencies in our state. According to the organization 'Over a dozen dogs are killed each year. Most were shot or stabbed by the suspects they were attempting to apprehend.' The goal of the VEST-A-DOG program is to provide a bullet proof and stab proof vest for every police dog in Wisconsin. The vests are the only protection these K-9 officers have until their human partners arrive on the scene. Wisconsin Vest-A-Dog was started in 2005 and is a non-profit, tax deductible organization endorsed by the Wisconsin Veterinary Association. Every donation to the organization is used for the purchase and shipping of vests and other protective equipment. The cost of each vest is around $850 - $1000 depending on which vest best suits each dog. If you would like to help, visit them here. Dog's contributions don't end at the end of people's time of service though, they are more commonly being used to help those that have served once they are done. Dogs being used for therapy is not new, but their use specifically with veterans of the armed forces to help them cope with their life after combat is somewhat new, but it is growing by leaps and bounds. As Time Magazine reported, 'It has taken nearly a decade of war--and the lack of a cure for posttraumatic stress disorder--to get officials to study the benefits of giving service animals to mentally ailing soldiers and veterans' but at least we are getting there. While the focus of Vest-A-Dog is locally, PetSmart, through their Gives Back foundation has created a national partnership that will help more wounded veterans get access to and information about a potentially life changing assistance dog. PetSmart for Patriots is a joint endeavor between PetSmart and Canine Companions for Independence, in support of Canine Companions’ Wounded Veterans Initiative to help partner assistance dogs with the military veterans who need them. Since 1992, Canine Companions has placed 102 assistance dogs with military veterans, with the number of dogs placed tripling since 2008. 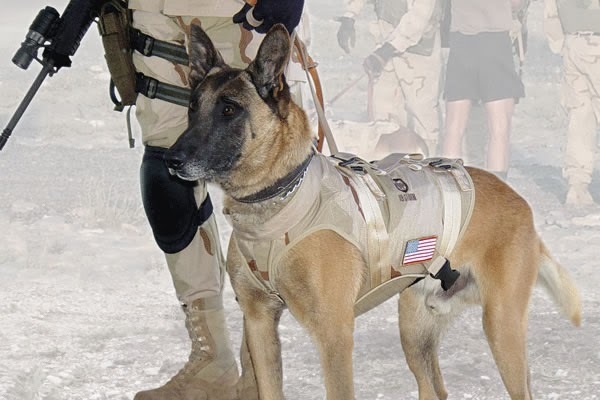 Many of those dogs have been placed with men and women who served in Iraq and Afghanistan and returned with spinal cord injuries, limb amputations and deafness. "This program is very personal to me--as a combat veteran, I know how hard it is to come back and transition to civilian life. It is that much harder to transition when you've been injured," said Bruce Thorn, PetSmart Senior Vice President of Store Operations and Services. "To be able to have a service dog who loves you unconditionally and is able to help you live a better life, is priceless." PetSmart is teaming up with Canine Companions not only financially, but also to raise awareness of assistance dogs among veterans. In the next 6-12 months, veterans with disabilities will be able to visit any PetSmart store and learn about Canine Companions and what they need to do to get their own assistance dog. In addition, a number of patriotic themed services in PetSmart stores will roll out in the summer of 2014 to honor the nation’s brave men and women in uniform. A portion of proceeds from special Grooming packages, PetsHotel® services and Training activities will benefit Canine Companions. Through Canine Companions, veterans with a wide array of physical disabilities, including non-visible injuries, may qualify to receive highly trained assistance dogs completely free of charge. Thanks to PetSmart’s efforts, more veterans will learn about this life-changing program and may ultimately benefit from it. Many veterans who are not in a wheelchair or are not amputees think that they don’t qualify for an assistance dog. There are veterans who have been through a traumatic brain injury and/or have a non-visible injury (like a back injury) who can still greatly benefit from an assistance dog. The program officially launched at a Canine Companions graduation ceremony today in Oceanside, Calif. The ceremony included an official kick off of the program by Thorn, as well as an inspiring speech by Calvin Smith, a Marine veteran who graduated from Canine Companions’ program in 2009. Smith, who was wounded during his second tour of duty in Iraq, attended with Canine Companions Service Dog Chesney, a black Labrador with the ability to respond to over 40 commands. The ceremony capped off with 10 persons with a variety of disabilities, including a Navy veteran, receiving their new assistance dogs. Whether national or local, each of these organizations is doing great work, helping those dogs that help us. We hope you consider giving to either or both of these worthwhile organizations that are friends to Man's Best Friends.